My night train arrived in Hyderabad, the capital of the new state of Telangana, at 8:30 AM. Since most hotels had a 24 hour check-in period, I wanted to buy some time before checking in. So, instead of taking a rickshaw the 3 miles to the hotel, I decided to walk it. Along the way, I passed by some large black video screens and police. I asked them what was going on and they said that there’s going to be a festival here tonight at 5pm. I kept walking and eventually arrived at my hotel, a cheap budget place with wifi that I found online. 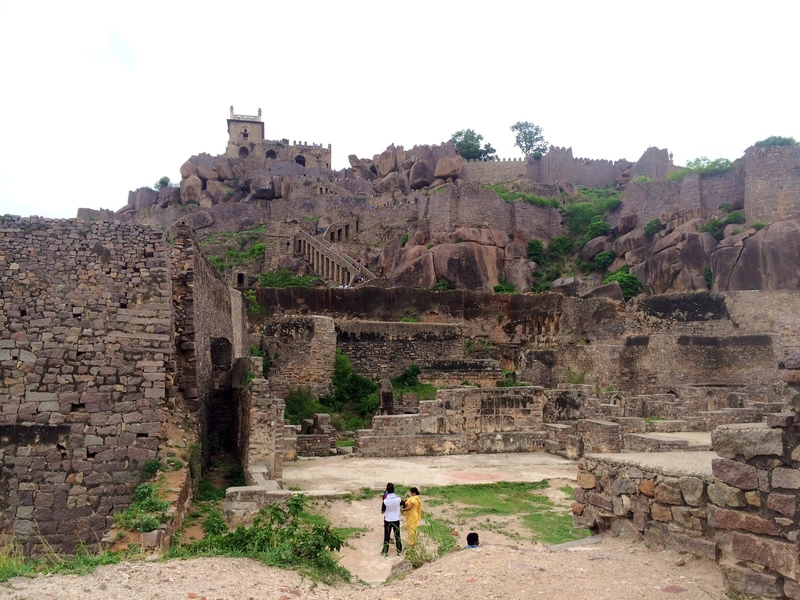 After settling in and eating breakfast, I decided to take a rickshaw to the Golconda Fort about 10 kilometers out of the city. The fort was built by the Qutb Shahs who ruled the area in the 1500’s. Because of the festival, everyone got free admission! The fort looked like Minas Tirith from the Lord of the Rings. Walls and pathways surrounded the citadel at the top of the hill. In addition to the castle at the top, there was also a mosque and a Hindu temple that was still active. On the way out, I saw a family skinning a goat for the festival. Naturally, I was curious because this was not something I normally see in a park. The family was honored that I took interest in them and asked me to help them skin the goat. Using a butcher’s knife, we separated the skin from the muscles and slowly pulled the skin off like a tight turtleneck sweater. The main butcher then went to work on removing and cleaning the organs while I took pictures with the family. The family invited me to eat the goat with them, but I wanted to do some more sightseeing. My next stop was the Qutb Shah tombs which are located about a mile away. I started to walk, but was approached by 2 kids who told me they were going that direction and said I could go with them on their motorcycle. So I hopped on and the bike sped off. We went dangerously fast and I flew in the air everytime we passed over a speed bump. Once we arrived, the kids insisted I give them a lot of money for the ride- way more than anyone would ever pay for such a ride. I refused since it seemed like they picked me up just to be nice. Angrily, they sped off. The tombs were absolutely beautiful and looked like the Taj Mahal but on a smaller scale. Both the rulers here and in Agra were Mughal so the architecture is similar. In this case, there were 7 kings buried here so there were 7 large domed tombs and some other smaller ones. Walking around the largest one, I saw some Muslim men laying on the ground and started talking to them. Turns out they were trying to pass the time and nap until sundown so they could eat since it is Ramadan. They all work in the tourism industry for US companies and all have fake American names that they use. One guy was named Hassan but went by the name of Jimmy Cage for his job (not sure how they pick names). We talked about a wide variety of subjects but the most popular subject was religion. When they asked me my religion, I said “I’m searching”. I have found that this is the best answer because people will teach you about their religion. I would never reveal my Jewish background. It really was not safe to discuss but more than that I don’t want to be forced to defend Israel in a debate. I didn’t travel around the world to defend my culture/background of which I had no authority. Rather, I traveled to learn viewpoints that I can’t find in the US. We did end up talking about Israel/Gaza. Jimmy and his friends believe that Obama was a slave to “Zionists” and that the only reason he supported Israel was because he would be assassinated by Israel if he does not. They also believed that 9/11 was an inside job to demonize Muslims. While I do not believe in any of those things (I didn’t reveal my opinions), it was cool to be able to have a peaceful discussion about a subject that normally gets very heated. Eventually, it was 3:30 and I wanted to make it to the festival, so I said farewell. On the walk to find a rickshaw, I ran into the kids on the motorbike again. This time they were really angry at me and grabbed my arm violently asking for money. I still refused (taking my wallet out in this situation would extremely risky) and ran away while they chucked stones at me. I quickly got into a rickshaw and fled the area. I instructed the rickshaw driver to take me to the a temple where I could see the festival, but for some reason he didn’t know where to go, so he took me to my hotel instead. Then I ran over to the street near the train station. The festival was just getting started. The black video boards were now flashing neon images of Hindu gods. Indian music blasted on speakers so loudly that it hurt to walk nearby. The crowds weren’t here yet, it was still somewhat busy and there were still rickshaws and motorbikes on the road. I walked down the street and saw a metal gate with a small crowd looking in. I decided to check it out. After staring for about 10 seconds, a man signaled for me to come in. I wasn’t sure whether he was actually signaling me or someone else in, but I went with it (even in the US if somebody waves in my direction I will wave back regardless- you never know what will happen). 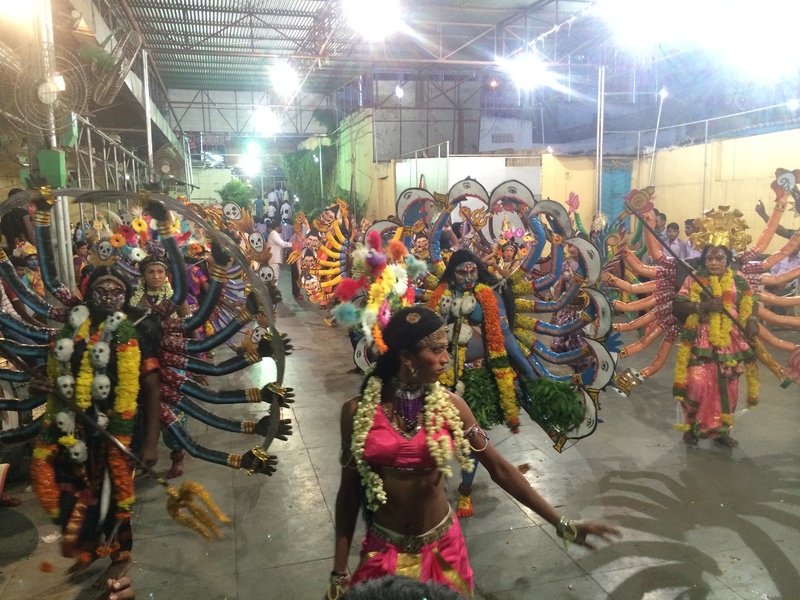 He took me to a large courtyard where dozens of dancers were preparing for the festival. There were half-dressed Shivas, drummers, black painted Polynesian tribal warriors and a large pullcart with a golden statue of a god. I walked through the courtyard taking pictures of the dancers and watched them practice their dances for the festival. Very quickly I was approached by about 10 boys between the ages of 8-15. They stuck out their hands aggressively and asked me my name and my country. Even though I was talking to a crowd of kids, each kid wanted to personally ask me these questions. 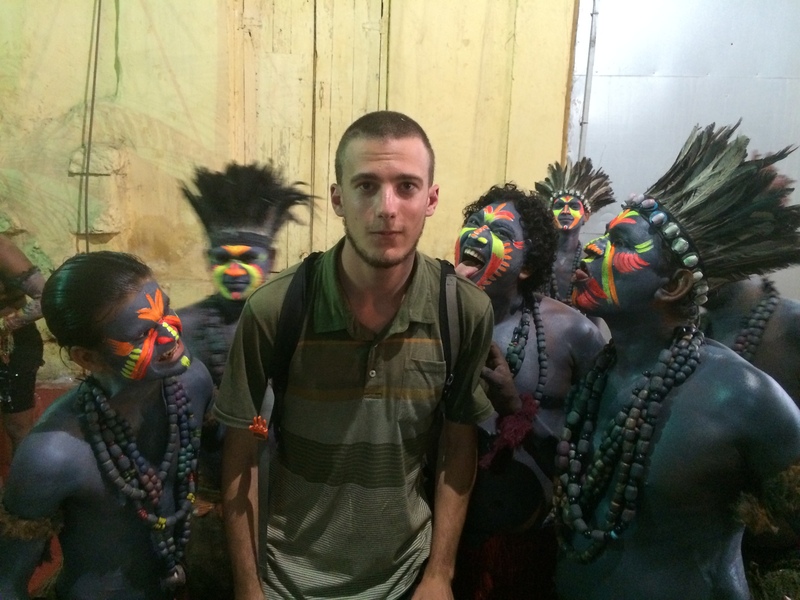 They then asked to take photos with me- partly because I am white but also because at 6’4″ I was the tallest person they have ever seen. The man who let me into the courtyard saw what was happening and decided to protect me. He got out a large stick and started whacking all the kids who came near me. This gave me the protection to walk around in peace. Sometimes my bodyguard would have to do prepwork or other things and new kids would swarm me just as quickly as my bodyguard left. All the men went crazy when these transvestites started dancing. Everyone stopped what they were doing to watch and take pictures. 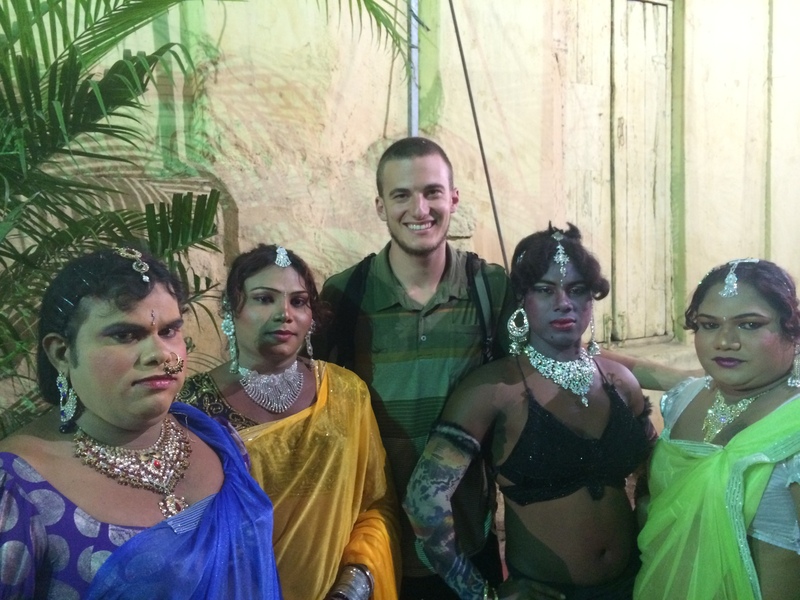 I wanted a picture with the Shiva dancers, but the men insisted I take a picture with them instead. Girls do not dance publicly in India so this is apparently very exciting. After 2 hours, we were all ready to go. We opened the metal gate and the dancers walked out followed by the drummers followed by the cart with the god statue. Unlike American parades, this parade was stationary. All the floats stayed in the same location but the people moved from float to float, making it easier for the dancers and the cart-pullers. Additionally, the street was not actually closed, so motorbikes and the occasional car would force their way through the crowd of 12-15,000. The crowds were massive, almost wall to wall people for 3 kilometers on the narrow street. Since there was no gate forcing them out, even more kids started approaching me by the hundreds since I was the tallest person at the whole festival. While I was never shoved, I did have many hands stuck right in front of my face for me to shake. At this point there were too many people for my bodyguard to handle, so he alerted the police. 4 armed police officers decided to guard me and brought me to a medium-sized stage set up in the middle of the festival. I sat on the front. There, they only allowed one or two people to approach me at once- it was kind of like an autograph line. While most everyone asked me the same 3 questions: Name, country, and photo, one man told me how it was his dream to work in the US at a call center and wanted to know how to get a job in the US. While I didn’t know the specifics, I suggested he practice his English, research US companies that he could work for, and look into the visa application process. He almost cried when talking to me and I hope everything turns out okay for him. Shiva dancers in the prep area. The arms are worn like backpacks. The emcee of the festival then decided to interview me. 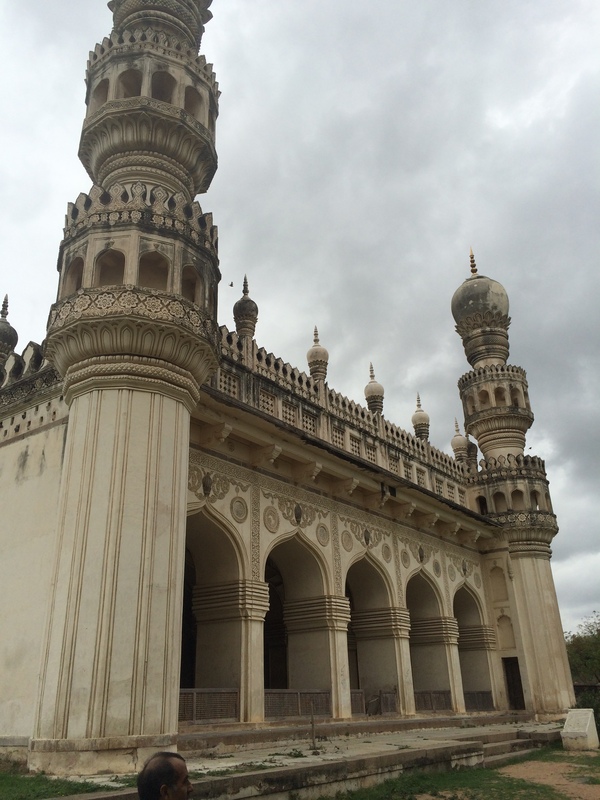 Hyderabad was located in the new state of Telangana which formed just 6 weeks before. To instill state pride, he asked me how I liked Telangana culture before asking me (forcing me) to start a cheer of Jai Telangana, which probably means Go Telangana. I yelled as loud as I could into the microphone and it got a medium applause as the emcee went into a fiery pro-Telangana speech where the word “American” sprinkled in. Around 9, my bodyguards decided that it was time for me to leave the festival since it was getting rowdy. They said lots of fights happen at festivals and it wasn’t safe for me to stay. I was then escorted to the edge of the festival before walking back by myself. I really had a perfect first day in Hyderabad.